← Sgt. Elihu Miner Jr.
Selden MINER (1780 – 1842) was Alex’s 5th Great Grandfather; one of 64 in this generation. Selden Miner was born on 12 March 1780 in East Haddam, CT just like his fatherElihu MINER. His mother was Mrs. Mary DEAN. He married Sally PEASE on 29 Nov 1810 in Hartford, Connecticut when he was 30 years old. Selden died on 8 Sep 1842 at the age of 62. Sally Pease was born 9 Nov 1781 in Enfield, CT. Her parents were Nathaniel PEASE III and [__?__]. When Selden died in 1842, her son Philo Miner went back to Connecticut and retrieved his mother and two youngest sisters to come live in Ohio. In the 1860 census, Sally, age 75 [implying she was born in 1785 Barber’s Connecticut Genealogy lists a Sally Miner born 24 Apr 1786 in Lyme, Connecticut] was living with her son Edward in Williamsfield Township, Ashtabula, Ohio. Sally died on 6 Jan 1871 in Mayfield, Cayuhoga County, Ohio at the age of 86. Sally PEASE (Mrs. Selden MINER), came to Mayfield OH with from Hebron, Conn., in 1843, the year after her husband died. Some of her sons lived here, and after their father died, one of them went back for the mother and her two daughters, Melissa and Clara. According to reports at the time, she was a bright, capable woman. 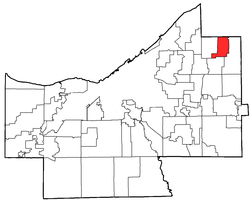 Mayfield Township was organized in 1819, being split off from Chagrin Township. It existed until 1920, when the entire township was incorporated into several villages: Gates Mills, Highland Heights, Mayfield Village, and Riverside. Since then, these municipalities have changed: Mayfield Heights left Mayfield Village in 1925, Riverside joined Gates Mills in the late 1920s, and Lyndhurst annexed a small portion of the township. Mayfield is a village in Cuyahoga County, Ohio, United States. The population was 3,460 at the 2010 census and it is the headquarters for Progressive Auto Insurance. The village is officially named Mayfield, but is typically referred to as Mayfield Village. Mayfield Village was rated the third best suburb of Cleveland by Cleveland Magazine for the second consecutive year and was once crowned the number one spot. 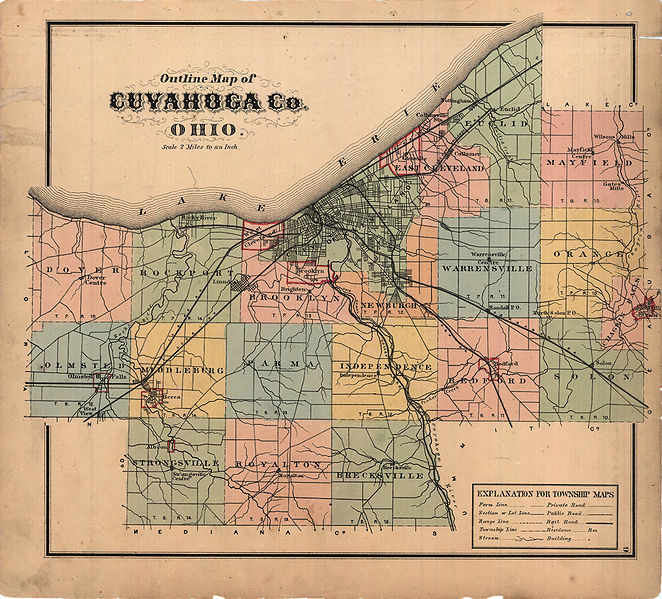 Mayfield, Cuyahoga, Ohio is situated about sixteen miles east of Cleveland. The Chagrin River winds through the town on its way to the lake. Selden Harvey Miner and his family were farming in Mayfield, Cuyahoga, Ohio in the 1850 census. His given name is listed as Sheldon. In the 1860 census, Seldon, Anna, Isabella, William and Frederick were still farming in Mayfield. In the 1880 census, Seldon and Anna were farming in Willoughby, Lake, Ohio and employed Adelia Damon age 34 as a house servant. William registered for the draft in 1863 in Mayfield, Ohio. In the 1910 census, William and Libby were living in Cleveland, Ohio with their adopted daughter Edith E, Ormsby, now Edith Miner. iv. Frederick L. Miner b. 1846 Mayfield, Cuyahoga, Ohio; d. 11 Apr 1917 Mayfield, Cuyahoga, Ohio; m. 17 Oct 1873 Mayfield to Nellie Cornelia Andrews (b. 1849 Wisconsin – d. 22 Apr 1925) By the 1920 census, Nellie was widowed and living with their son Sterling Miner (b. 17 Aug 1874 Mayfield, Cuyahoga, Ohio) still in Mayfield, Ohio. Her grandfather was Nathan Miner born 29 Mar 1771 d. 4 Jul 1854 Peru Mass. Her great grandfather was Christopher Miner, born on 14 Jan 1743/44 in Stonington, CT. 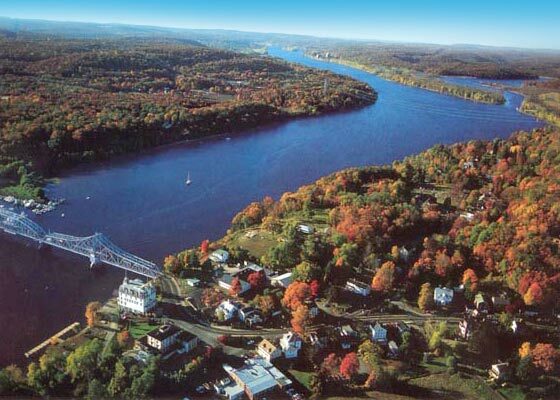 Her 4th Great Grandfather was Manassah Miner born on 28 Apr 1647, the first white male child born in New London, CT.
i. Ervin (Irvin, Irving) B. Miner b. Sep 1844 Ohio; d. betw. 1910 -1915 Ashtabula, Ohio. m1. d Mary E [__?__] (b. 1845 Pennsylvania – d. bef. 1900 census,) m2. 1902 to Betsy [__?__] (b. 1860 Ohio – d. Aft. 1930 census Geneva, Ashtabula, Ohio) Betsy was previously married with one child. In the 1880 census, Ervin was a peddler in Summit, Crawford, Pennsylvania. In the 1900 census, he was living in Geneva, Ashtabula, Ohio. In 1915, Betsy was a widow living on 16 Eastwood Street, Geneva, Ashtabula. ii. Eugene Calvert Miner b. Jul 1847 Ohio; d. 10 Mar 1920, buried in Gustavis Township, Kinsman, Ohio; m. Sep 1869 to Alice Orinda [__?__] (b. May 1843 Ohio – ) In the 1900 census he was a farmer in Wayne, Ashtabula, Ohio. iii. Minnie Miner b. 1855 Ohio; m. Thomas Ford (b. Sep 1845 Crawford, Pennsylvania – d. 29 Jan 1919 -Massillon, Stark, Ohio) His parents were Andrew M. Ford and Susana A. Boggs. Thomas was an interesting character. In the 1880 census, Thomas was a showman living with his mother-in-law Elizabeth in Wayne, Ashtabula, Ohio. In the 1900 census, Thomas was a manager of a circus in Geneva, Ashtabula, Ohio. In the 1910 census, he was an inventor and manufacturer. iv. Stiles L. Miner b. Apr 1857 Ohio d. 3 Sep 1938 Geneva, Ashtabula, Ohio; m. 1885 to Jennie Minier (b. Oct 1863 in Pennsylvania; d. 1 Dec 1930 in Cleveland, Cuyahoga, Ohio.) Her parents were Samuel G. Minier (1825 – 1903) and Amanda Morley (1833 – 1872). In the 1920 census, Stiles was a house painter in Cleveland, Ohio. Melissa’s husband Asahel Akins was born 13 Jan 1825 in Euclid, Cuyahoga, Ohio. Early in our history, free form spelling was common, but was becoming more unsual by Asahel’s time. He was baptized Aschel Pelton Aikins 24 Jun 1827 in the First Presbyterian Church, East Cleveland, Cuyahoga, Ohio. I have seen Asahel, Ashael, Aschel, Asabel, Asahel, Asel and Akins, Aikens, and Akin. i. Francis Asahel Akins b. 2 Jan 1849 in Mayfield, Ohio. Francis attended Baldwin University of Berea, Ohio. He was a farmer and secretary State Grange. He was president of the state of Mutual Fire Insurance associations; in 1890 was elected secretary of the Ohio State Grange Patrons of Husbandry, and received the re-election for four successive terms. ii. Estella (Stella) Aikens b. Feb 1850 Ohio In the 1880 census, Estella was living at home in Mayfield, Cuyahoga, Ohio and working as a seamstress. Clara’s husband James Leroy Whiting was born about 1822 in New York. His parents were Samuel Whiting and Sarah [__?__]. In the 1850 census, he and Clara [listed as Clarisse] were farming with his parents in Mayfield, , Cuyahoga, Ohio. In the 1860 and 1870 censuses, the four were still farming together in Mayfield. Leroy’s mother’s name is recorded as Sally for those years and his wife is listed as Clarissa in all three censuses. By the 1880 census, Leroy’s parents had passed on and Leroy and Clarissa’s only son Charles (b. 1852 in Mayfield, OH) was a 28 year old widower living at home. By the 1900 census, Charles had remarried to Lizzie B. [__?__] in 1896, Leroy had passed on and Clara was living with her son and daughter-in-law. Charles and Lizzie didn’t have any children and continued to live in Mayfield through the 1920 census. i. Charles L. Whiting b. Jul 1851 Mayfield, Ohio m1. [__?__] ( – v. 1880); m2. 1896 to Lizzie B. [__?__] (b. 1859 Ohio – After 1940 census) d. after 1930 census Mayfield, Ohio Charles was a farmer. Edward’s wife Sybil Woodworth was born 10 Jun 1831 in Ashtabula, Ohio. Her parents were Samuel Woodworth and Aurilla [__?__]. 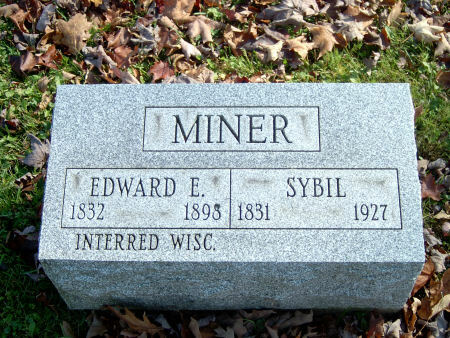 Sybil died 24 Apr 1927 in Ashtabula, Ohio. i. Carrie Miner b. 1854 Ohio; m. 1871 to Samuel L Alexander (b. Feb 1846 in Pennsylvania – ) In the 1905 Wisconsin census, Sybil was living with Carrie and Samuel in Stanley, Chippewa, Wisconsin. In the 1910 census, Carrie, Samuel and Sybil were living in Fond du Lac, Wisconsin where Samuel was the manager of a brickyard. iii. Frank Miner b. Jun 1860 Ohio Frank was still living at home in the 1880 census. and like his father, working as a carpenter. iv. Albert Miner b. 1870 Ohio Albert does not appear in the 1880 census. This entry was posted in -7th Generation, Line - Miner and tagged Children immigrated from CT to OH, East Haddam CT. Bookmark the permalink.